It is hard to be under the weather when Mrs. Mills is around. Since her generous hearted piano-playing was discovered at a golf-club social evening by band-leader Paul Cave back in the Sixties, any sort of family singalong worth its salt has become synonymous with the name Mrs. Mills - Happy-Maker Extraordinary to millions on disc, radio and TV. Director Geoff Love has been supervising the music for all the albums that Mrs. Mills has made for Music For Pleasure - so what more natural, when you come to think of it, than that two such lively personalities should get together so that we could all benefit from their undivided attention ! Here's how it happened . 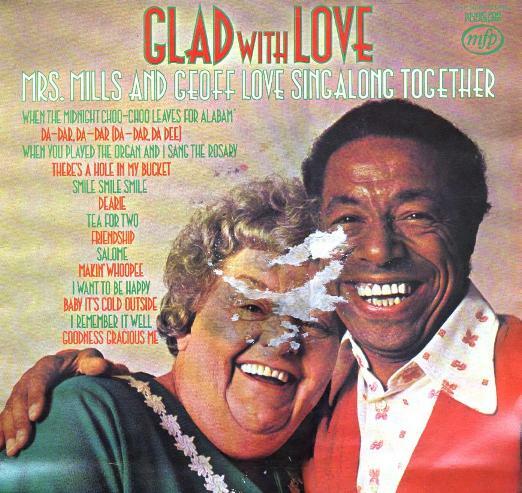 . . Mrs. Mills ('Glad' to all of us from now on) was doing a recording one day (under the direction of Geoff Love) in front of a studio audience. When interval-time came Geoff thought it would be fun if Glad did an impromptu 'spot' to amuse everyone. Glad said: "Good idea - if you'll do it with me". So together they improvised a very zany duet -Da-dar, Da-dar (Da-Dar, Da Dee). The audience was in fits. So were Geoff and Glad . . . and so were the engineers who had quietly taped the number - mistakes and all - because everyone was having such a great time. When they heard it Geoff and Glad decided to string along together and do a whole programme of vocal duets (including that one - just as it was). Of course we knew you'd want to hear a couple of solos from this exuberant pair as well, so there's Glad doing Salome and Geoff doing When the Midnight Choo-choo Leaves For Alabam' (and no prizes for guessing who plays harmonium in When You Played The Organ And I Sang The Rosary). When you singalong with Glad, or listen to Geoff chatting for only a minute or so, you immediately feel part of a warm and happy group. Both radiate an irresistible ' 'come-on-and-join-us" atmosphere which gathers everyone up. This is a bumper package of vocal favourites for all ages. A togetherness-maker from start to finish for, as the title of the album suggests, when there's a bit of Glad around there's a lot of Love too. I Want to be Happy is the opening number on this album. . . Friendship the last. So if these are your sentiments too - what are we waiting for!